Officially established in the summer of 2017, Cohesity Thrive’s mission is to provide the best experience for college students who are eager to make an impact. Cohesity interns have the opportunity to gain valuable work experience, learn about innovative technologies, and network with the best talent in the space. The program is led by HR Coordinator, Shahla Raouf, who believes that people make the difference in the company regardless of the role you have. As a marketing intern, I was able to experience this program and it’s one of the most rewarding experiences I’ve had. I am learning new things daily from my mentors and having fun along the way! Below are the events that I attended as part of this program. Cohesity was honored for the second year in a row by The Bay Area News Group, as a Top Workplace in 2017. The awards party took place at Levi’s Stadium in Santa Clara, where interns were able to attend and participate as part of the Cohesity family! This is one of my favorite events! Equipped with professional flying gear, we sat around the huge indoor wind tunnel laughing as we watched each other struggle to stay airborne and control facial expressions. Laughing and enduring our in-flight struggles together was the perfect way for the interns to bond. I had an awesome time. 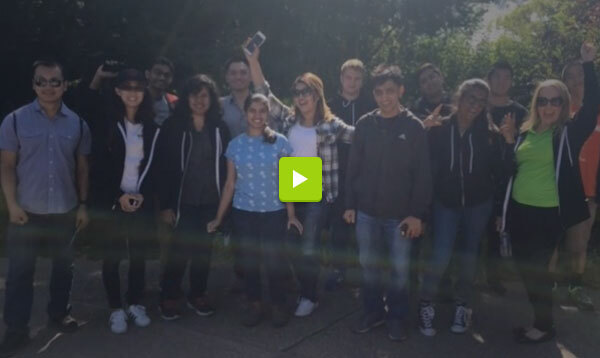 We did a scavenger hunt event earlier this week in Palo Alto with our mentors. It was a great way to build the bonds between the interns and mentors. The event ended with a delicious lunch at Opa. We have weekly intern meetings where leaders from different departments introduce themselves and talk about their role/function. It’s great that our leaders take the time out of their busy schedule to talk to us about their experiences. Cohesity Thrive Hoodies: Showing off our pride! The interns received new hoodies exclusive to just the interns! Cohesity interns can be seen wearing their hoodies with pride wherever they go, to remind them of their Thrive family. The sapling in the logo represents our continual growth throughout the program & beyond, that will create roots and a strong network for us, both personally and professionally. The last three months have been great, and I look forward to learning and participating in the fun events that Shahla has planned for the rest of the summer! If you want to join this humble, fun team, check out the openings here.